Okay, I am stumped. 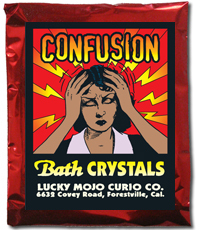 How and why would someone use Confusion Bath Crystals in a spell? For one thing, it can be used s a "sneaky trick." You could add it to the salt that is used by the city to melt snow and ice and your evil neighbors would have to step in it to get to their car. Oh, thank you, Miss Aida. I get it. To confuse an enemy it can be dissolved in water and sprinkled al around his or her car. The water will evaporate, but the enemy will have to walk through it to enter the car. After we both finished laughing, i explained that two great old traditional ways to use bath crystals are to make floor wash and to sprinkle some into laundry water. So, let's say you have a roommate or visiting family member in the house who is overly critical, harsh, and picky. One way to diffuse the problem is to render the person confused, so as to more easily rule them and take charge of the situation.